I’m all set now to get out the door in the morning to Indianapolis for a USDAA trial. Today I did a bit of mowing in the lower field, but didn’t actually set anything up to give Kory some work. I’m not too concerned about it. I manage to get Kory a bit of work every time I teach a class or do a private lesson. He’s a solid demo dog. The weekend should be a lot of fun. Scott Chamberlain is the judge. He tends to put up technical courses. And I like the challenge. My boy isn’t in Masters yet; so we get the gentled-down version of the Chamberlain thing. The weekend will be a test of my gather & drive handling system. Just to define terms: in general I’ll work Kory at a distance but gather him in for technical instruction at control points in the course, before driving him on again. The only place here I need to be close to Kory would be on the landing side of jump #2 in the transition past the dummy winged-jump to jump #3. So I’d probably open this sequence with a Blind Cross and then draw him very close to my left hip on the landing side of jump #2 for a flat curl to present jump #3. After managing this technical moment, I can release him on to work and pretty much direct with verbal directionals. The most important reminder for me will be to maintain constant and fluid motion. Handlers with fast dogs who work well at a distance often get bogged down in their movement and wind up flat-footed like a stump in the swamp. Movement is both motive and direction. The handler’s movement is intrinsic to basic communication with the dog. Movement is direction. Movement is motive. Snakes N′ Ladders is a strategic game that has Snakes (tunnels) and Ladders (contact obstacles and weave poles.) The objective is to complete all Ladders and cross the finish line as quickly as possible. The dog can start with any obstacle. To successfully complete the course the dog must perform all Ladders without faults and cross the finish line before the expiration of time. The finish line is not complete until all Ladders have been performed. At least one Snake—but any number of Snakes—must be performed between the Ladders. Individual Snakes may be performed any number of times. Each individual Ladder may be performed only once. Missed contacts or failure to complete will result in course faults. Performance faults are the same as in the standard classes. If a dog completes one Snake the handler is not obligated to finish any subsequent Snake that the dog might touch or select before going on to a Ladder. If a dog starts a contact obstacle, that obstacle is now the obstacle of choice. The handler must direct the dog to complete in that direction before moving on. If a dog leaves a contact obstacle prior to completion the dog will be faulted according to the DOCNA fault table. The handler may choose to go on or use the training in the ring guidelines. Training in the ring will be scored Elimination. If a dog starts the weave poles, that obstacle is not the obstacle of choice. The handler must direct the dog to complete in that direction before moving on. Back-weaving will be faulted according to the DOCNA fault table. Any two Ladders are performed in succession without taking a Snake between. A Ladder previously performed is attempted again, whether by intention, or wrong course. Snakes N’ Ladders is scored Faults Then Time. No placement will be given for a score of Elimination (E) or No Time (NT). The difficulty in the design of this class is creating a balance for performance of the technical obstacles, with plenty of flow options for pipe tunnels in between, without actually giving away the farm in terms of challenge and overall flow. While a superior strategy for solving the course might emerge fairly early in the class, the distribution of obstacles should lend itself to a variety of possible solutions. The weave pole requirement for Snakes N’ Ladders at the Beginner level includes three sets of 5-6 poles. At the Intern and specialist level the dog is required to perform one set of 10-12 weave poles. · The fastest way to complete the course is with only 11 obstacles: three contacts, three sets of weave poles, and five tunnels. · The fastest way to complete: begin with either a contact or weave poles. And of course, it’s worth remembering: every time you do either a weave or contact, you must do a tunnel. Snakes N’ Ladders is an eligible qualifying game for play in both Dogs on Course in North America (DOCNA) and the Teacup Dogs Agility Association (TDAA). An elder Cherokee man was teaching his grandchildren about life. He said to them, “A fight is going on inside me. It is a terrible fight between two wolves. One wolf represents fear, anger, envy, sorrow, regret, greed, arrogance, self-pity, guilt, resentment, inferiority, lies, false pride, superiority, and ego. “This same fight is going on inside you, and inside every other person, too”, he added. This blog entry is largely a rerun from a bit while I kept my blog on AgilityVision. Since that entry no longer exists, I thought I might include it here, on a more stable platform. I’ve removed a small bit of political diatribe that is no longer relevant (it was published right before the elections in 2008). The handler is the emotional catalyst of the team. The dog derives his sense of haste from the handler’s movement. Strategic Time Gamblers is a two-part game. The dog and handler team must be successful in both parts of the class in order to qualify. The Opening and Closing periods are discussed in some detail, below. Obstacles can be taken only twice for points. Back-to-back performances are allowed. At any time during the opening the bonus obstacle (described below) may be taken for its point value. In the closing the objective is to collect as many points as possible and, most important, to end time before the expiration of time. Typically the game is played 30 seconds for the opening period, and 15 seconds for the closing. In the Closing the handler works against the clock while collecting points. The dog may do any obstacle up to two times for points (even those previously taken in the opening period.) Back-to-back performance is allowed. The goal is to collect as many points as possible and stop the clock by crossing the designated final jump as close as possible to, but not over, the course time. Typically a specific obstacle is designated as the finish obstacle. This allows for an unambiguous conclusion to point accumulation. Note: Taking the designated final obstacle in any direction during the opening or closing will end scoring and stop the clock. At all times during Strategic Time Gamble the handler must continue to work the course, collecting points. Should the handler loiter for the finish line, and is clearly not working to obtain points, the dog will earn Elimination. By performing a specific obstacle designated as the bonus. Note: Completing the bonus obstacle earns the dog an extra 5 points in the closing. Earning a bonus increases the window of opportunity for scoring points. 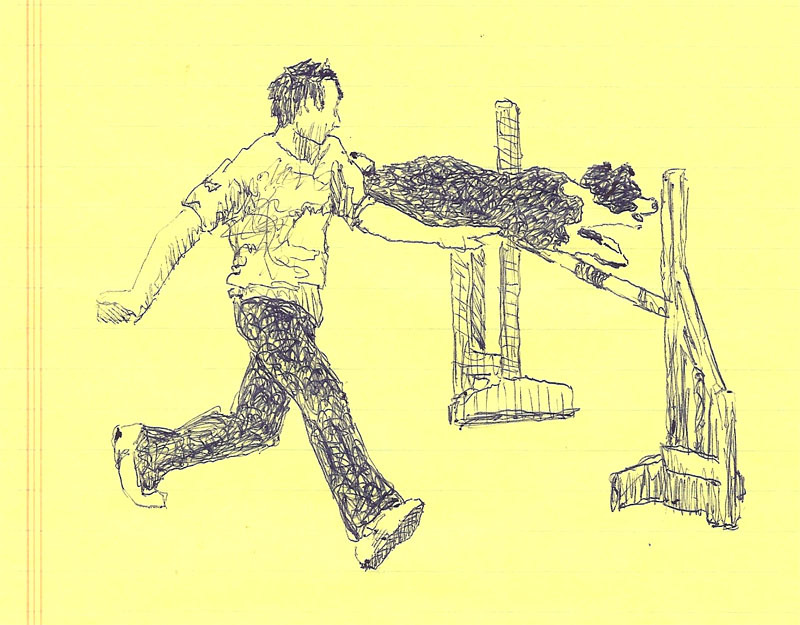 Without the bonus the dog must take the finish obstacle between 42.5 and 45 seconds (if the judge uses 15) in order to qualify; (a 2.5 second window). With the bonus obstacle the window is opened up one second on either side, between 41.5 and 46 seconds; (a window of 4.5 seconds). The final horn/whistle sounds at 47 seconds. If the dog obtains a bonus but the final horn or whistle sounds before he is done, then the dog is over time. Strategic Time Gamble is scored Time – Then Points. Note: The dog with the higher time will place higher, so long as he doesn’t go over course time, because he is closer to the target course time. In the event of a tie in the times, the highest total point accumulation value determines placement. If there is still a tie, the highest point accumulation in the opening determines placement. The last tie-breaker is the highest point accumulation in the closing. Strategic Time Gamble, like any dog’s choice game, might be carefully nested with other courses or games. The design should accommodate a variety of options for flow so that many interesting strategies might evolve. The time-bonus obstacle should be positioned relatively accessible to the finish obstacle so that it is easily attainable by slower and faster dogs alike. Strategic Time Gamble lends itself to perfect nesting or all levels playing the game as qualifying scores are based on differentiation in the number of points required to be accumulated. 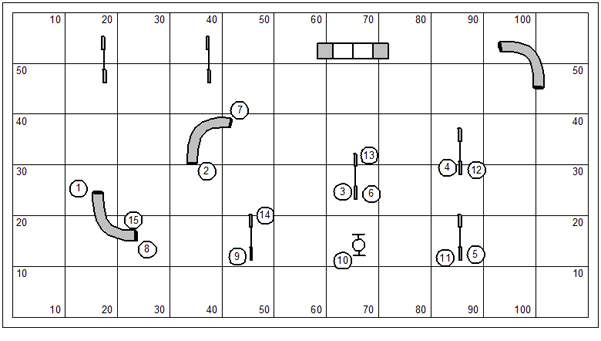 In DOCNA, if doubles and triple are used the course will have to be adjusted between levels. For example, Beginners level may not contain double jumps; triples are used only for Specialist level; Select at any level will have ascending double jumps only. Strategic Time Gambler begs that the handler has a good understanding of the dog’s working speed. It is desirable for the handler’s strategy to give the dog a timely approach to the bonus obstacle as the Closing Period begins. And, of course, it is desirable to earn the maximum number of points in the final 15 seconds without going over course time. Ideally the dog will earn the Time Bonus by scoring 25 or more points in the opening period. But even if he does so, the bonus obstacle is highly desirable in the closing because it is weighted with an additional 5 bonus points. Inasmuch as this is a dog’s choice game, in which the dog can perform obstacles in the order and direction of his handler’s choosing, it might be an admirable idea to avoid those problem obstacles that consume time or are prone to fault. However, if the handler chooses to eschew qualification, or high placement, this class might be used to work through problem obstacles to facilitate success in the standard classes. To qualify the dog must earn the minimum number of points respective to the level of play and finish within 2.5 seconds of the established course time. 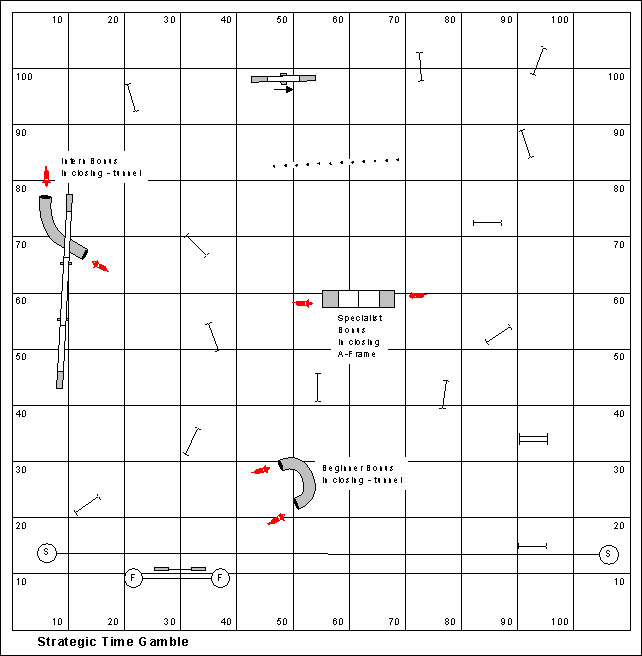 Strategic Time Gamble is an eligible qualifying game for play in both Dogs on Course in North America (DOCNA) and the Teacup Dogs Agility Association (TDAA). In DOCNA Strategic Time Gamble is included in mix with Traditional Gamblers so that any combination of qualifying scores between the two Gamblers classes result in Title awards. In what popular movie was the ancient Cherokee parable at the top of this post quoted? Every premium for trial entry will typically include a page for you to sign up… to volunteer to help make the trial run smoothly and quickly. And the page will typically entice you with the promise of a free lunch… or $2.00 off your next trial entry. When I work I usually try to be a course builder. It’s something I’m pretty good at, and it doesn’t really have any demands on my time during the conduct of the class. But if it’s a one ring trial I don’t have any problem with volunteering to do something that will absolutely numb your brain, like scribing or timing. I come from a culture in which it was inconceivable that a lot of people would sit on their hands while a few people did all the work. A well run trial is a great delight. Everything runs along smoothly, and you get out of there at a reasonable hour. There’s only one way that can happen… when just about everyone jumps in to do some small part. There is a list of reasons that people won’t work at trials. Each probably demands some discussion. This sometimes might be true, but not usually. The cost of putting on a trial can be incredible. The host club takes all the risks, bringing in the judge, providing equipment and the maintenance of that equipment, renting a trial site, putting up tents, renting portable toilets, feeding their volunteers. Nearly as often as not you’ll see classy conduct and hard work from agility hot shots. Unfortunately there are some that just aren’t very good role models. Often enough their students and associates adopt the same slothful habits as though they were virtues worthy to be emulated. It’s not really smart, but it happens. I could share a bunch of anecdotal stories about how volunteers get abused, mistreated, and disrespected. But I won’t. There is no better way to lose good workers who are truly the backbone of this sport, than to treat them poorly. This is a pretty good excuse. The exhibitor with several dogs really is giving pretty good financial support to the host club. But even this exhibitor could help by getting involved with setting up the trial site; or tearing it down. Most clubs would be thrilled to give you the crash course to help you learn one of the key roles for making dog agility competition happen. And, don’t forget the free lunch. I return from South Boardman, MI where I conducted a small TDAA judges’ clinic over four days. I took Hazard along with. Although I’m not going to run her at the Petit prix I still love competing with her in the TDAA. My girl had a magnificent weekend. She was in the ring 8 times, and walked away with 8 qualifying scores and 8 first place ribbons. Between you and me and the wall I ain’t really bragging. I was competing against a field of handlers who were flummoxed by the essential riddle of agility: The Riddle of Sides. With about 80 percent of the handlers in this sport I could in a two-day clinic teach a thing or two that would double their success in this sport. Okay, now I’m bragging, I suppose. But it’s true. Some things are fundamental. If you get the fundamentals wrong… how can you really expect to be successful? The Riddle of Sides: A dog turns most naturally toward the handler. The crafty handler will dispose himself to the side of every turn; to the inside of the curve. This design is based on one of the games we played this weekend (In and Out). I need to offer a modest discussion of how a handler might get on the turning side of the course. To me it’s a statement of the obvious. Truthfully you can’t believe it’s very obvious if about 50% of handlers get it wrong. The Back Cross that so many people did that really drove me nuts was at jump #6. What? It’s a fairly simple matter here to have dog on left at jump #6. Why create the emergency handling scenario? 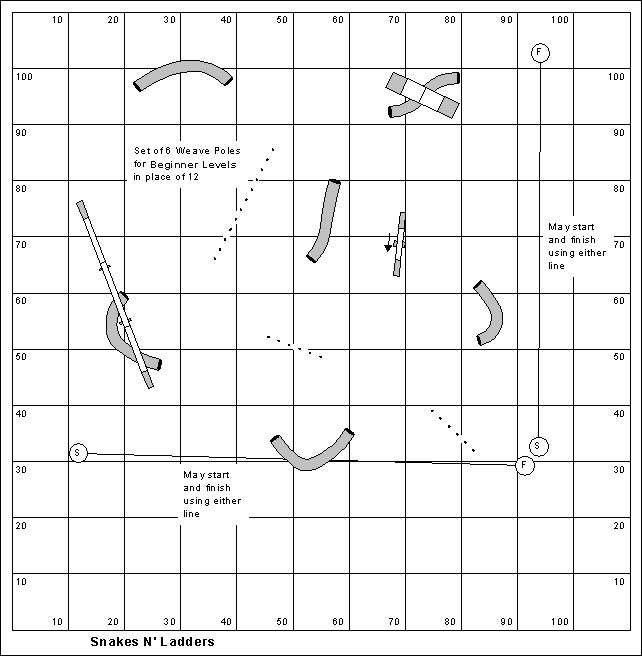 Indeed, the nimble handler will also step to the landing side of jump #6 for another Front Cross to again be on the turning side of the course after jump #7. The course is divided into 3 loops: the “inner” loop, the “in-and-out” loop, and the “outer” loop. If a fault occurs during a loop, the dog must immediately restart from the first obstacle of that loop. The loop is repeated until completed without fault. Then the dog starts the next loop. The judge will call out “fault” when a dog faults an obstacle. Standard faults apply: refusals are not faulted. The standard course time for each level will be set at a rate consistent with the standard classes. The game is scored points then time. Time is a tiebreaker only. If the dog completes the entire course before time runs out, the difference between the dog’s time and the course time becomes bonus points added to the score. You must complete the course within your SCT for your level to qualify. In and Out is a wickedly difficult game to design. With the use of contact equipment it’s necessary to create square approaches to the contact obstacles to keep things safe. This is trickier than it might seem. 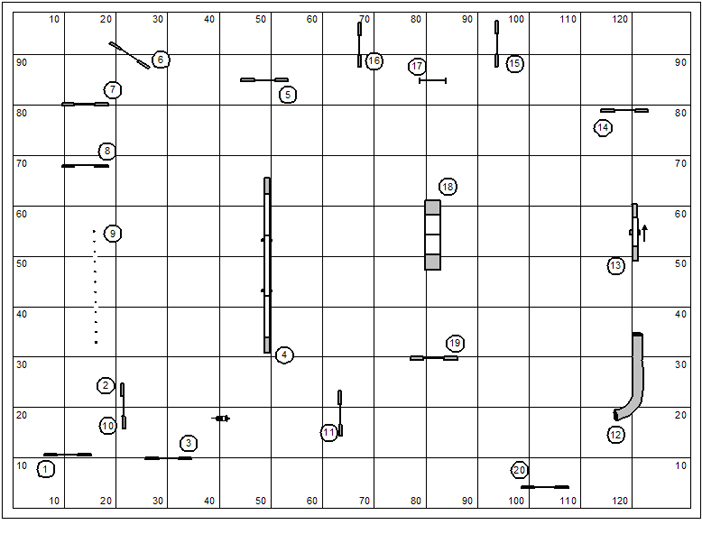 A common mistake in the course design is making all the “loops” move in the same direction, so that the entire competition is either clockwise or counter-clockwise. You can see that the designer of the sample course above used interesting transitions between the loops that changed directions. While the “In and Out” loop is a bit of an adventure, it’s all doable from a handling point of view and the approaches to contact obstacles are kept square and safe. If the sample course has a flaw, it is the use of the collapsed tunnel to be taken twice… or possibly more than twice if the dog faults that loop. This is really a simple follow-the-numbers game embellished with preposterous convention. Rather than calling it a “standard course” the inventor of the game determined that the dog could redeem any fault by repeating whichever loop he was working on. In real life this turns out to be little more than a “loser’s lap” because repeating any of the loops basically takes the dog tantalizing out of range of any possibility of qualifying (much less winning, or placing). It’s a points based game… and basically all dogs earn the same number of points (if they finish the course). Time, the tie-breaking criteria, becomes the only essential statistic for placement. To add insult to injury every dog that finishes under course time will be awarded a time-deduction bonus of the difference between his SCT and his actual time. This in no way changes placements; but skews the differential between those that finished the course under time, and those who did not. I’m not advocating that the game should be played any differently than it is historically played. I just wanted to point out how silly are the embellishments. In our league play what we’d like to do is make a comparison between dogs of different heights that compete against one another; giving a handicap advantage to dogs with shorter legs. This table reflects a rational differential between jump heights. The columns are: Jump Height; Rate of Travel; and Percentage for Handicap. This table plays with a variety of scores that could be expected from the different jump heights (in the Time column). Multiplying the dog’s time on course by the Percentage of Handicap in the previous table gets the Handicap Adjustment score and the Placement Results. In a free-flowing and barely turning sequence like this, there might be only about one yard of difference between the 4″ and the 26″ dog. The handicap calculations are really based on this kind of flow. On a more technical sequence with tight turns like this one, there will be about 8 or 10 yards of difference between the 4″ and the 26″ dog. And this is only a moderately technical sequence. So the adjusted rates of travel should give less advantage to the small dog in the comparison of course time. So it looks like there needs to be a technical factor that softens the advantage given to smaller dogs. I haven’t completely figured out the math. It looks like all of the handicap percentages need to be based on a ranked number 0-5 that will drop the handicap percentage based on a Rate of travel as much as .5 yps, stepping down through the jump heights; but probably no more than that. How do you handicap a points-based game? It strikes me that it should be the inverse of the numbered course logic. Traditionally small dogs are given more time in a points game. That means the small dog has to work longer than the big dog; a fact that doesn’t make terrible sense. It’s like saying that the small dog has greater stamina than the big dog. Instead, what we might do is add a multiplier factor against points based solely on the rates of travel. So points earned by the 4″ (in the same QCT) would be multiplied by 1.37 to arrive at a score that can be compared to the performance of the 26″ dog. It strikes me that a motivated Yorkshire Terrier could rule the agility world. In the movie Grand Hotel John Barrymore carries a dog across the lobby of the hotel under his arm and gives the dog over to a bell-hop, telling the young man to walk the dog until he’s “completely worn out.” What was the breed of dog under his arm? Kory double Q’d his last day in Queen City; and his standard course was clean. I actually thought he’d missed the down contact on the dogwalk; but the judge apparently saw it otherwise. I practiced the Gather and Drive handling system I’m working out with Kory. Sunday’s courses seemed well suited to that style of play. Marsha made her debut with Tempest and had a fine weekend with the boy. At 15 months he has some great skills and is fast and willing. His rough edges will be ironed out in training and as his brain grows into his body. We had two judges on the weekend at Queen City DTC. The course below is from Howard Etzel, a nice young man with competent judging skills and nicely flowing courses. Howard dismissed a woman from the ring for cussing. She loudly exclaimed “Damn it!” whilst waffling through a handling bit, and so he blew his whistle. The judge was smiling as he did so… making me question the logic of dismissing from the ring an exhibitor that wasn’t truly being offensive. Anyhow… I had a chat with one of the instructors at QCDTC, suggesting that in their agility training program they include some instruction on the language arts. The problem obstacle in the opening was the wrong course pipe tunnel after jump #3. A surprising number of handlers had dog on right at this jump (disposing the dog to key on the pipe tunnel). But even with dog on left, some dogs came over the jump convinced that the pipe tunnel might be next. Out of the weave poles the transition from #6 to #8 proved to be challenging. This is Open, remember. There were a fair share of wrong courses over jump #15; and at jump #7 a list of difficulties associated with rear crossing on novice dogs got exposed. 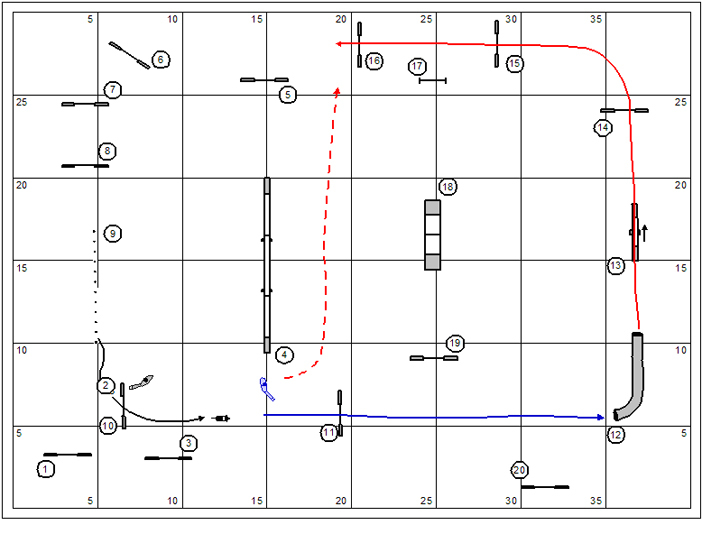 Another interesting transition was from #13 to #15 with jump #7 presented as an inviting wrong course option. And at the close of the course the wrong entry to the u-shaped pipe tunnel enticed at least a couple dogs. My gather and drive strategy had me pretty much hanging out in that Bermuda triangle of jumps… #6, 7 & 15. After ripping apart the opening Kory got a refusal at jump #16 drifting wide, I supposed, being enticed by jump #2. I recovered him, and got the dirty Q. 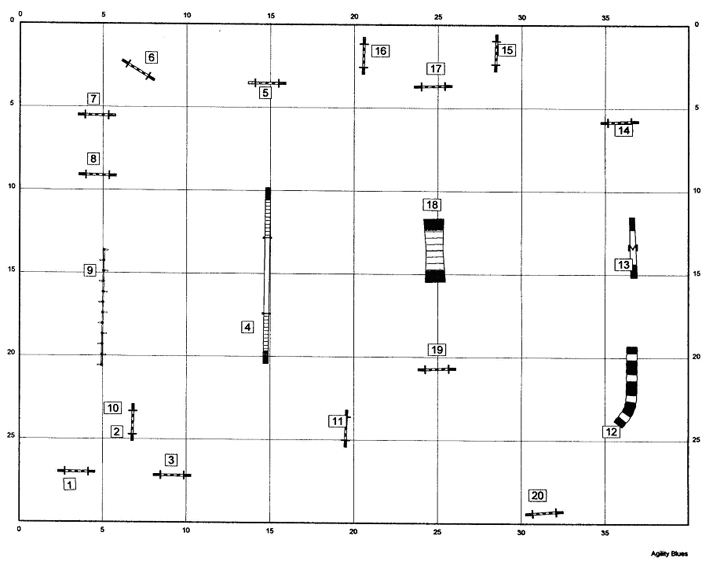 A lady named Jean from (presumably) Europe sent me the course map below. The course is designed in metric units. This is a course I did at the weekend.. I stayed at the bottom of the course because of No 3 and 10. After 11, I sent her on while I attempted to run up the side of the A-Frame. By the time I was half way up she was already over 16 and heading for 6. I’m not good at directing her while I am running. My question is: Is there any way I can teach my dog to do a push in as in No16 to 17 from a distance? I think Jean’s analysis is spot on. She’s looking for a control position strategy for a fast well trained dog. You can see what the judge has done here. 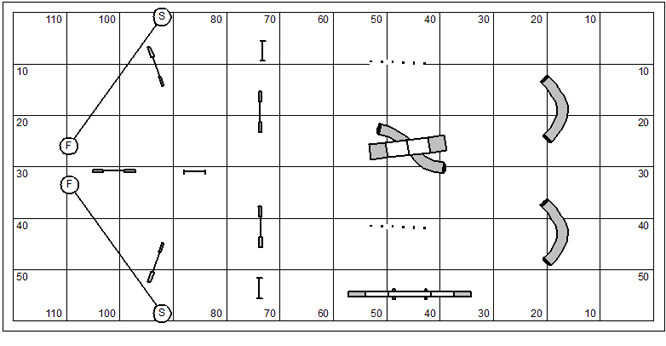 The lower-left corner of the course features a depressed angle approach to jump #3 on the dismount of the weave poles, with an option on the approach and an option on the dismount. This is one of those moments that requires the handler to a) be lucky or b) be close enough to direct the dog through the technical moment. This bit is followed by a fast run with the dog covering two very long sides of the ring; going into an incredibly technical bit: A 270˚ threadle with an inviting option in the dog’s turning radius. So the real question is whether the handler can get a position up in the crook of the turn to manage the very technical moment. After jump #15 there’s a real possibility that the dog will turn left to a wrong course at jump #17 if the handler is OOP. But it sounds like Jean’s problem was losing her dog more towards jump #6, because she didn’t get into position in time. I’m guessing that Jean’s dog doesn’t do a 2o2o on the teeter (we can be envious here). So it’s just a minor speed bump as the dog makes his way up the right side of the ring. So the riddle is… can the handler make it to the second control position? Jean’s asks if there’s a way to do the 270˚ threadle (with option) at a distance. That would be a fine circus trick indeed. I can tell the dog to turn left; but that immediately exposes the option. With distance trained dogs we invest a lot of training effort in teaching good obstacle focus a distance. I (personally) have no protocol for teaching a dog to avoid an obstacle, at a distance. I had to make a switch to metric just to lay out the course properly. 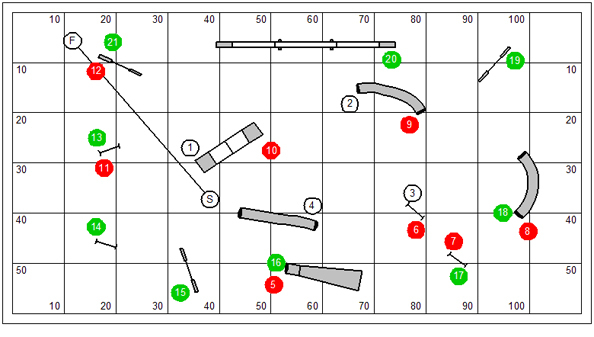 The tool that was used to design the course was not the Clean Run Course Designer. To be honest I don’t even know if the jumps are winged. We don’t see course design much like this in the U.S. It’s like a mad blend of NADAC with incredibly long speed building lines; interspersed with moments of horrific AKC technical whimsy. I’m a little concerned with jump #20 being against the front of the ring. I’m guessing that they judge gave a bit more room on the dismount of the last jump when he tweaked the course. You’ll never see the long transitions (#10 to #11; #11 to #12; #19 to #20) in American course design; at least, so far. My weekends now are full of agility trialing which is very cool. However, the pressure on the weekends compresses into the middle of the week where chores I might have otherwise have done on the weekends require attention. Summer has come into full bloom which means constant work with lawn mowers and weed whackers. Also I have several “spring cleaning” kinds of projects from things that got out of hand over the winter. Last weekend I showed Kory up at the USDAA trial in Medina, Ohio. It was quite fun. And he managed to finish three of his Novice titles. My next outing in the USDAA will be at Pawsitive Partners in Indianapolis. In the meanwhile, this weekend I’ll be at an AKC trial in Cincinnati. Marsha will be making her debut with Tempest. And Kory will be in the Open class for the first time. Time has passed between the previous paragraph, and this. Kory got qualifying scores in Jumpers and FAST yesterday, and in Standard today. Tomorrow we’ll get another go both at Standard and Jumpers. I’ve been scribbling a diverse hodgepodge of notes (yes, even on napkins); but nothing substantial enough for publishing to the web-log. I’ve been wrestling with the paradox of the training and handling system I’m working with Kory dog. 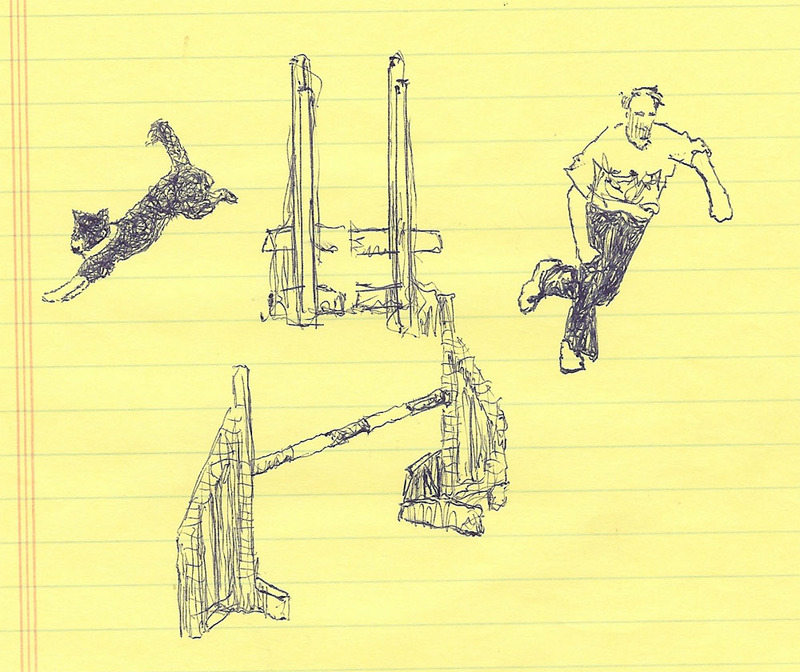 I dragged out my old Agility Chi notes… and a thrill went through me as I realized that I’d already begun the work there and through some unconscious process have been practicing those elements of training and handling. I’ve known all along that I need to document training objectives and methods, and very clearly outline the handling system philosophy. Agility Chi will be the foundation, and my scraps of notes will have to come into form around it in some coherent fashion. Objective-wise, I don’t want to write a thick and erudite volume, but a sleek and concise workbook, easy to digest and implement. It’ll be The Art of War for a game in the park with a dog. So there’s my vision statement. I’ll put audience, purpose, and scope under separate cover and get to work on it right away. That’s what I needed, another project. The objective of What’s My Line is to perform all of the obstacles on the field without repeating any or leaving any out. The dog earns one point for each obstacle performed successfully. If an obstacle is repeated the dog loses a point. There is no standard course time. What’s My Line is scored points then time. Time is a tie-breaker only. The team with the most points will win. Obstacles may be numbered at the judge’s discretion. These numbers are for the judge’s reference only and in no way suggest a sequence for running the course. When a limited number of obstacles are used for more advanced classes, the judge can stipulate a standard course time that will challenge the field to solve the course in a specific timeframe. What’s My Line can be nested easily with another game requiring only minimal tweaking. 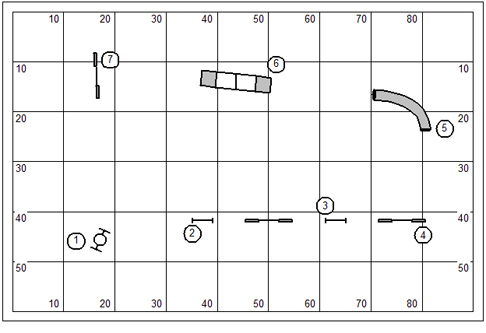 This doesn’t really deprive the course designer the pleasure of designing a delightful riddle. Design the What’s My Line riddle first then nest the standard course or other game to it. Don’t be hoisted on your own petard. The handler’s job is to find the most economical path for the dog to perform all of the obstacles. In any game with a finite number of possible scores time will be the ultimate tie-breaker. The dog’s path should be both economical and as flowing as possible. Qualification must be based on the number of obstacles on the course. The question for the judge is whether to require a perfect game to qualify; or to give the field leeway for qualifying, leaving the perfect game to the intrepid. Traditional ~ In this variation scoring ceases upon the repetition of any obstacle. In the movie Man Hunt Thorndyke (Walter Pidgeon) was trapped in a cave by a Gestapo thug. How did Thorndyke make his escape? … back from Dallas. The Top Secret project is nearing fruition; requiring only the definition and fulfillment of prudent project planning steps. Yah it’s still Top Secret and I have no agency to make it otherwise. I will say only that it’s the end of the world as we know it. It was a mad rush coming home from the USDAA trial at BRAG this past weekend and packing up to scurry off to Dallas. I left the Blog notes in the middle of an incomplete sentence I am sure and no real updates as to my boy Kory’s performance on the weekend. It struck me more than once through the weekend that I was practicing a different game from virtually everyone around me. If you’ve followed by Blog notes at all over the past couple of years you know that I’ve resolved to train Kory to work at a distance. So whilst everyone around me took to every sequence as a cheek-to-cheek two-step with their dogs, I had my boy on trampoline as I worked from the conductor’s pit. Okay, I admit, I’m a new conductor more novice than virtuoso. It is new music, after all. But it’s clear that with a bit of the magical mystery ingredient we’re on our way to Carnegie Hall. I’ve known a thing intellectually for quite some time… that when working with a great distance dog my job as handler and provocateur of the plan is to find the control positions on course to solve its various elements. On the weekend I found myself practicing the skill, indeed bringing the ephemeral theory into solid form and practice. I was elated to find that virtually without exception the control-position focus worked exactly as plotted on the drawing board. You’ll have to trust me, I’m not getting cocky here. Holding a paint brush doesn’t make you Da Vinci. I’d like to put some of my control-position control theory stuff on video to share on YouTube because the two-dimensional qualities of pictures and words can’t really tell the story. That won’t be today for sure. So let me instead numb your mind with a bit of theory. The Control Position is a vantage point on course in which the handler applies transitional leverage to direct the dog. It could be simplified or summarized as a moment of “micro-management”… but in a broader sense the handler is like an air traffic controller directing the dog’s flow in (landing?) and releasing the dog again for work away (a “takeoff”). In the analysis of any course-work the control-position handler has to identify those positions on the course at which he will be correctly positioned to be a successful traffic controller; that is manage a series of take-offs and landings without air-ships crashing and killing everyone aboard. The traditional logic in dog agility is that the handler will tie the dog to his hip and then run run run scraping the animal off on obstacles along the way. This is a fine plan and exactly right for any springy legged young thing who is actually faster (factoring in clever cheats) than his dog. 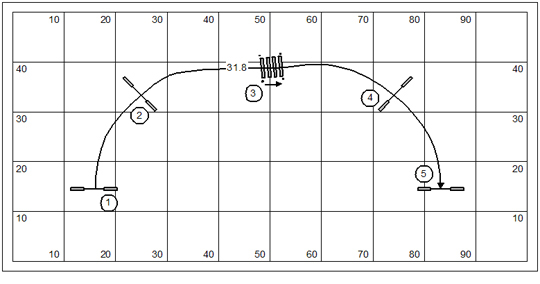 To put the handling plan into perspective, the 19 obstacle course will have 19 control positions. It seems to defy any economy of scale. In order for the dog’s speed to mean anything he has to be released to work and unencumbered by the plodding pace of the handler. I’m OMW now to Medina Swarm for a USDAA trial this weekend. The weather guy promises temps in the lower 70s. That should be delightful. I was cooked in Columbus and frankly quite concerned about my black & white pup in 90+ temps. I did everything I could to keep him as cool as possible. But I think both of us were a bit heat-struck by the end of the weekend. One of the number keys on my keyboard has also gone “unresponsive”. Which one? Just so we can agree on terminology, for the purpose of this discussion fast dog handling will be those movements that are behind the dog, and pushing; slow dog handling will be those movements that are forward of the dog, and pulling. A speed change is making the transition from slow dog to fast dog; or from fast dog to slow dog. I know a lot of you are fond of the dog training mission for the handler to stay on one side of the serpentine while the dog goes back and forth over the jumps (doing all the work). But is a handler training exercise; so I will specify handling. The handler begins with fast dog handling, opening the sequence with a series of Tandem Turns. Note that the Tandem Turn is a pushing movement, a form of the Back Cross, crossing behind the dog on the landing side of each jump. At the pipe tunnel the handler will make the speed change, to slow dog handling. Because the handler is forward of the dog he will slip change sides forward of the dog (I’m showing a Blind Cross here). What happens next really depends on the speed of the dog. This is the crucial moment of extemporaneous decision for the handler. If the handler can stay forward, then another Blind Cross would have an electric influence on the dog. However, if the dog is sliding forward the Blind Cross has “fail” written all over it. So here the handler should make a speed change. Okay, I’ll be unable to finish this morning the discussion I’ve started here. It strikes me that complexity of “extemporaneous” decision making is too complex for a chunk of prose wrapped in paragraph. What I’ll often tell my own students is “don’t run the plan; run the dog.” Running the dog I suppose is the test of the natural handler; handling solution is entirely based on the movement and response of the dog. The discussion of speed changes is important enough. In my classes we’ll practice intentional speed changes so that the student/handler recognizes those important transitional moments when they happen in the dust and tumble of competition. This morning I’m in a hotel in Columbus; and I’ll be headed soon to the BRAG USDAA trial. This is Kory’s coming out party in Columbus. I’ve really been looking forward to this. I didn’t sleep well last night; so I’ll rely on deep muscle memory rather than being particularly sharp. More later. You are currently browsing the Bud Houston's Blog blog archives for June, 2011.